Health and Safety Executive (HSE) statistics for 2010-2011 show that more than half of fatal employee injuries were of three kinds: being struck by vehicles; being struck by falling objects; or falling from height. Forty-one fatal injuries to workers involved slips and trips or falls, of which 93 percent were falls, with 56 percent involving high falls of two metres and above. In total there were more than 6,800 falls from height injuries in the UK, and this remains a serious occupational safety challenge with increasingly sophisticated fall protection equipment being developed. It is well known within the industry that individually three key components (anchorage, body wear and connecting device) of personal fall arrest equipment will only provide protection from a fall when used properly in conjunction with each other. More worryingly, however, and what is perhaps less well known is that there is no European Standard to ensure that the equipment performs as intended and is safe for workers to use at height. In 1995 a new harmonised European standard, EN 353-1:2002 (Personal Protective Equipment Against Falls from height - Part 1: Guided type fall arresters including a rigid anchor line), was introduced. History shows that it was a flawed compromise, however, as it appeared to be more focused on breaking down trade barriers than safety. Unfortunately, this meant that it achieved the lowest common denominator and was less comprehensive than any of the British, French and German standards which it replaced. Because of this flawed compromise, in March 2010 the European Commission withdrew EN 353-1. This followed a number of serious accidents and fatalities as a result of falls from ladders with installed fall arrest systems. An HSE report highlighted such cases in the Netherlands, Austria and Germany with problems that included three cases (one fatal) where the arrester ran off the end of the rigid rail anchor lines, even though there had been an end-stop fitted; two cases where falls occurred as the devices failed to operate properly, but with little injury; and a further two cases where the device failed to operate properly and resulted in serious/fatal injuries. The Standard was also withdrawn after pressure from the UK as research commissioned by the HSE successfully demonstrated that EN 353-1 failed to meet fundamental safety requirements. Primarily this was because it did not test for reasonably foreseeable fall conditions such as a ‘fall back’ or ‘sideways fall’, which significantly increased the risk that the device might fail. The current EN 353-1 tests wrongly assume that when you fall from height you fall straight down, but of course, the human body actually falls away first, before falling downwards. 1. As the CEN committee, the European Standards’ Body, saw no need for the anthropomorphic test dummy (ATD) test it was deleted, despite UK objections. The irony is that the BS 5062 standard included a test method using ATDs that could accurately simulate a human falling back or sideways from a ladder with an installed fall arrest system. So, a means was available to detect the dangerous aspects of a product’s performance, which was absent in EN 353-1 and was the key reason for its withdrawal. Indeed, the UK has been a world leader in the use of ATDs in safety testing since 1947. The HSE was so concerned by these technical shortcomings within EN 353-1 that it commissioned further research which evaluated various types of test surrogates (substitutes for human beings) such as ATDs, sandbags, steel weights and torso dummies (quasi-human shaped, rigid manikins without a head or limbs). The research is documented in research reports CRR 411, RR 258 and RR 657 and showed that dangerous aspects of a product’s performance may not be detected if ATDs are not used in tests. 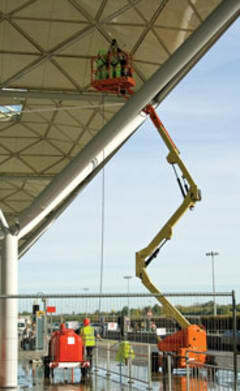 For example, on fixed ladders fall arrest equipment stopped a falling weight, but not an ATD. Also, harness straps garrotted an ATD, while the torso dummy failed to reveal this life threatening issue, because it did not have a neck or head. As a European Notified Body that has been accredited to assess whether a product meets certain preordained standards, a key concern of NEL’s is that it appears that there will still be no requirement for the use of ATDs in tests for any future European standards. With the presumption of conformity removed from the standard, this means that it is no longer officially recognised as a means to certify equipment. So, for equipment that gained its CE marking solely because of a test against this standard, this may not be legal or safe and it cannot be used in a workplace anymore. This means that as the CEN standards’ committee struggles to draft a replacement standard and the UK continues to push for the use of ATDs, fall arrest equipment manufacturers and operators face a dilemma. The EU’s advice is that, after the withdrawal of EN 353-1, Notified Bodies should follow the latest draft RFU (Recommendation for Use) CND/P/011.73 for current EC type examinations of these devices. With the technical committee in Europe unable to agree on the next steps towards a new standard, it is therefore up to each Notified Body to decide what tests in addition to the now withdrawn EN 353-1 Standard it will accept before they assign CE marking to a piece of fall arrest equipment. Manufacturers therefore have to test against an interim standard which has tried to emulate elements of ATD testing from historic standards using steel masses. A technical file must continue to be submitted to show that their products meet the essential health and safety requirements, and fulfils the required technical specifications. For example, the HSE produced a Technical Guidance Note on inspecting personal fall protection equipment in 2006, which NEL uses as part of the CE marking process for fall arrest equipment. The technical file is stored for the duration of the CE certification, to ensure that yearly inspections can be referenced against the initial specification agreed and no manufacturing deviations have been made. If a system manufacturer makes a change in component specification, or moves manufacturing location, the CE certification test house should be notified and testing will be required to ensure it still meets the original specification. If so, a CE amendment can be made. NEL provides testing to EN353-1, the current RFU sheet, and in addition full ATD testing with four simulated drop scenarios, tested over two ATD weights. This delivers not only conformance to the current EU recommendations, but also invaluable human interaction with the system based on real life fall possibilities. A steel mass cannot demonstrate the fall scenarios that we have witnessed through both experience and testing, and will never be able to provide a testing method suitable for a system including the human interaction of the harness - which is every bit as critical as the arrester device itself. Even if there were an agreed standard, however, harmonised standards very often represent the bare minimum of what must be done as they are a compromise between member states. For those manufacturers that want to build their brand reputation for supplying the most reliable safety equipment and, perhaps more importantly, want to avoid damaging their reputation if their equipment fails, other tests should therefore be done, such as those currently performed at NEL. At a minimum, NEL tests to EN353-1 and to satisfy the requirement for additional testing (until a new standard can be created and harmonised) with anthropomorphic test dummies, performed with four defined drop scenarios. The drop scenarios are designed to mimic real life situations, and have the added benefit of testing the full system in a realistic scenario while not endangering any actual subjects, or test engineers. The four scenarios are described as ‘fallback’, ‘sitback’, ‘climbfall’ (sideways) and a straight vertical fall. As an additional measure, the four tests are duplicated over two weights of ATD, to ensure the performance of the system is tested at more than the basic 100kg requested weight. The full suite of eight tests provides not only additional testing to satisfy the current certification standards, but also an opportunity to observe the full scope of the system and its interaction with the human form. Likewise, when considering CE marking, it is also vital to remember that this should not be used as the sole criterion for purchasing equipment. This is because the prime function of CE marking is to protect against trade barriers with the European Union and should not be taken as a mark of quality for products. There is often a presumption that a CE marking means that the equipment will be suitable for the particular task for which it is being purchased, but this may not be the case, as the testing specified in the relevant European standard is often limited to checking the most important parameters under laboratory conditions, and therefore may not cover the specific circumstances of use. The Personal Protective Equipment category III (equipment for protection against mortal danger) within the CE marking requirements, is subject to more rigorous controls than most other products, where class I and II can be looked at in some circumstances as self certification. Class III needs to be tested by an independent test house and cannot be self certified as fit for purpose. It is therefore essential to ensure that the marking is for goods appropriate for the intended use. While industry best practise advice is that the three individual components of personal fall arrest equipment will only provide protection from a fall when used properly in conjunction with each other, there is no requirement for them to be tested together to receive a CE marking. This means that while they have a CE marking as an individual piece of equipment, as a trio they could fail. We have experienced this in our tests, where one harness failed, with the dummy falling straight to the floor. Where any system is constructed with the sole purpose of protecting a human body, it is vital that the system in full is tested in such a way to replicate its intended use. As the harness forms a vital element of the rail system it should not be excluded from the CE testing procedure, as it would be if current (and withdrawn) standards are followed. A steel mass cannot provide a realistic interpretation of how a human body responds while experiencing a fall scenario. The interaction of the harness itself with the body during an arrest is overlooked within current RFU testing methods. The only way a system should be tested to ensure human survival is as a complete assembly, with replication of the human form to analyse the performance of the fall arrest system. For the reasons of brand protection and product safety assurance, both manufacturers and operators are therefore continuing to ask NEL to test equipment using test methods based on the old BS 5062 standard which used an ATD, to safeguard that it does not fail or contribute to a death. To gain a better understanding on the effectiveness of any future test standard, NEL has now been commissioned by the BSIF (British Safety Industry Federation) Height Safety Group to carry out comparison tests on a series of fall arrest systems using ATDs and steel masses. This will assess whether the steel weight tests can simulate the fall of a worker from a fixed ladder, particularly the falling backwards motion that results when both handholds are lost, and whether the tests are capable of detecting product design deficiencies which are capable of having an adverse affect on fall arrest performance. Both of these aspects are covered by testing which uses an ATD. From previous test results, steel masses cannot demonstrate the interaction between the human body and the harness. The present method of testing a harness involves the use of a stub limb dummy, which, although it covers most aspects, fails to provide indication that harness slippage could potentially strike or garrotte the user at point of arrest. Should an ATD be used and harness slippage occurs, it will highlight potential life threatening results that are currently overlooked by existing test practises. As a harmonised standard, the rules dictate that CEN must develop a replacement standard within 12 months, but as the members of the technical committee leading this are in complete disagreement over what tests should be used, this hasn’t happened and it is unlikely to for the foreseeable future. When a new standard is finally agreed, despite the evidence, it seems unlikely that ATDs will be required. The proposed RFU sheet issued by the technical working groups seeks to emulate ATD testing methodology with the substitution of steel masses over ATDs. When it comes to life saving fall arrest equipment, we want CEN to adjust its focus from easing trade barriers to the safety of workers. Within the industry it is hard to see a way out of this impasse; meanwhile, people run the risk of being seriously or fatally injured. Looking at other industries that involve a human interaction system, such as car designers, the amount of testing and research performed using lifelike ATDs is overwhelming in comparison to the testing methods proposed for a system that is designed solely to save lives.